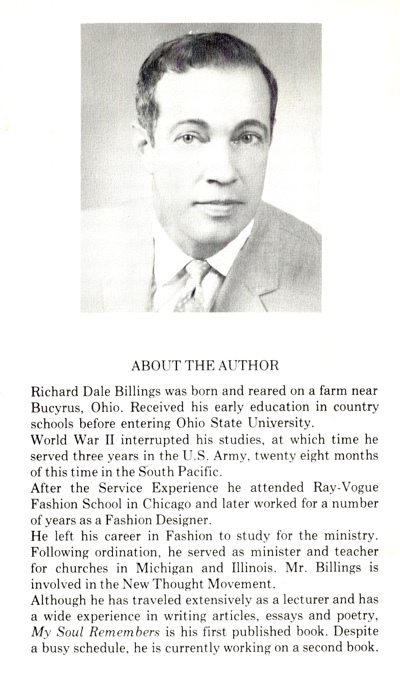 My Soul Remembers is Richard Billings' autobiography—of his previous lives. There is no clearer portrayal of one’s experience of reincarnation and the wisdom it provides than this book, in my opinion. Richard's recollections of soul are emotionally raw, graphic and captivating. His interpretations of these events are interwoven with a wisdom reminiscent in style and depth of Khalil Gibran. Rev. Richard made his transition this past Monday, February 18, 2019. 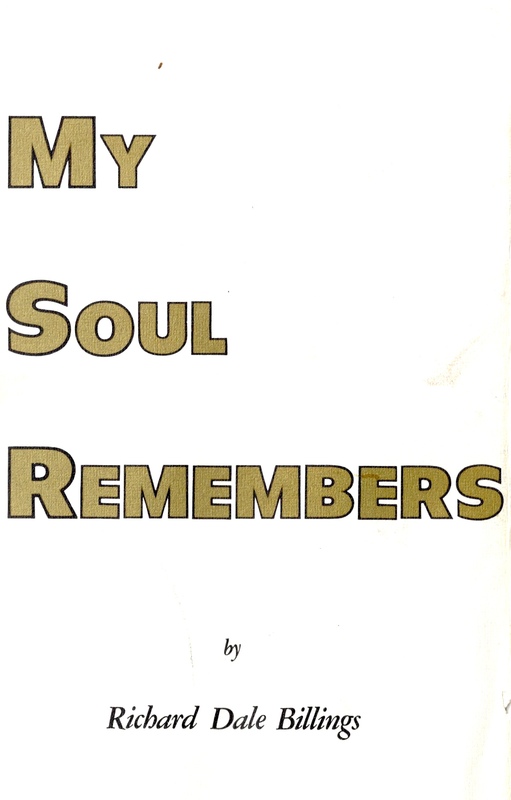 This page has links to the full text of My Soul Remembers and also a link to a PDF of the original 1972 book. Click here to watch our 2015 interview of Richard and to read his obituary. Richard’s recollections in My Soul Remembers move from living as a devotee of Christ, as an asian Buddhist, as a Chinese geisha and as a European gypsy. His soul remembers life with an African husband and the loss of stillborn children, a nun’s life journey to and escape from a South American convent and ministering to the sick, the hopeless and the confused with Juan, her soulmate and lover. His memories of married life in America are more mundane, hitting closer to home for many. My desire was to blend with the magnificent display; I was reluctant to let her go. In a last goodbye I heard her whisper, "I'll see you, in what you call tomorrow." That is great metaphysical writing. My Soul Remembers will provide courage for those who fear, comfort for those who grieve and hope for those who have loved deeply. Rev. Richard, that your life path has crossed our life path is our great joy. That you have left us this guidebook to life's eternal journey is our great blessing. We will see you, in what we call tomorrow. In a flowing, lyrical style reminiscent of the late Gahlil Gibran, Richard Dale Billings takes the reader on a sojourn into the realm of Reincarnation. It is a beautiful journey. My Soul Remembers is a book that one will want to read over and over again because of the beautiful style and inspirational content. One reader wrote of the manuscript, “It is a deep spiritual journey of the entity along with the physical memory that enjoins the reader to the author. Reading My Soul Remembers is decidedly a memorable experience, and it provides a wealth of food for thought. This is a book that will enrich any library. Richard Dale Billings was born and reared on a farm near Bucyrus, Ohio. Received his early education in country schools before entering Ohio State University. World War II interrupted his studies, at which time he served three years in the U.S. Army, twenty eight months of this time in the South Pacific. After the Service Experience he attended Ray-Vogue Fashion School in Chicago and later worked for a number of years as a Fashion Designer. He left his career in Fashion to study for the ministry. Following ordination, he served as minister and teacher for churches in Michigan and Illinois. Mr. Billings is involved in the New Thought Movement. Although he has traveled extensively as a lecturer and has a wide experience in writing articles, essays and poetry. 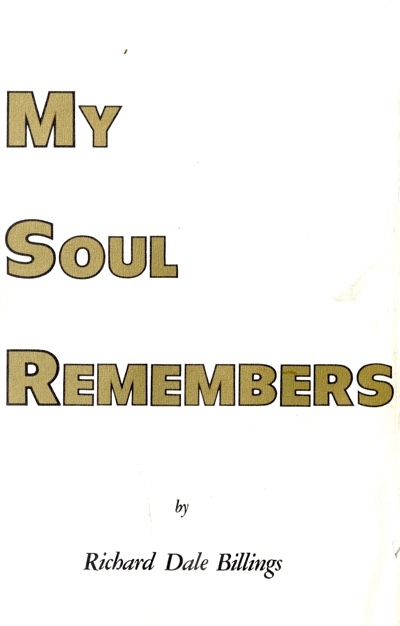 My Soul Remembers is his first published book. Despite a busy schedule, he is currently working on a second book.